In the United States, when abortion became legal in 1973, the Supreme Court basically declared that unborn people don’t have constitutional rights like those of us that are out of the womb do. In further denying the “personhood” of unborn children, proponents of abortion insist on referring to a child in the womb as a “fetus” rather than a “baby” or a “child.” One of the great challenges of the pro-life movement has been how to give back this personhood to the little ones inside their mother’s wombs who have no voice that can be audibly heard yet. 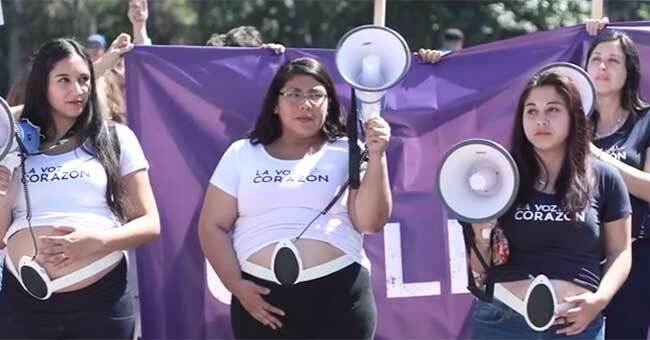 These women strapped fetal heart monitors with speakers to their pregnant bellies, then marched the streets of Chile with megaphones up to the monitors so that their unborn babies’ heartbeats – “the voice of the heart” – could be heard loud and clear by all nearby. They did not chant, cheer, or even carry signs as they marched together toward government buildings. They simply let their children’s voices, through their heartbeats, send a lesson about LIFE. If you believe in being a voice for unborn children, I hope you’ll share this post on Facebook!